I noticed this while filing another ticket (JENKINS-41496), but the "Changes" view for the Pipeline run for this project "azure" has the "wrong commits" shown. See the screenshots for more. What basically appears to be happening is that any change to a Shared Library will result in newly triggered Pipelines which have "Poll SCM" configured. Pipelines which configure a timer will also have Changes from the Shared Library listed when it executes again. I think listing the Shared Library commits in "Changes" is acceptable, but triggering based on an SCM Poll for a Pipeline is very confusing behavior and IMHO incorrect behavior. As a shared tooling team, I would not expect my Shared Library changes to trigger a bunch of Pipelines for projects depending on them. 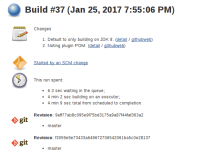 JENKINS-41442 Configuring Pipeline Global Library injects History into Job. Angelo Loria not sure if that is related to this issue: but I think that may be possible by using "when" and looking at the cause/trigger. So when global libraries are updated, the job will run, but terminate early (green) as it can skip the rest of the build. Kind of a work around. Michael Neale added a comment - 2019-01-03 00:42 Angelo Loria not sure if that is related to this issue: but I think that may be possible by using "when" and looking at the cause/trigger. So when global libraries are updated, the job will run, but terminate early (green) as it can skip the rest of the build. Kind of a work around. Cenk Tosun another solution to your issue is to use "lightweight" checkout when defining the Jenkinsfile SCM. I think it was intended behavior to allow polling on changes to the jenkinsfile scm - but lightweight will disable that (if you are using an SCM that supports it). 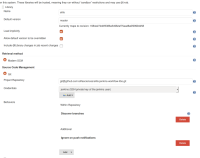 William Brode added a comment - 2019-03-12 23:13 Cenk Tosun another solution to your issue is to use "lightweight" checkout when defining the Jenkinsfile SCM. I think it was intended behavior to allow polling on changes to the jenkinsfile scm - but lightweight will disable that (if you are using an SCM that supports it). William Brode I do not see that the lightweight checkout actually solve this issue.